CLEVELAND (KGO) -- The Golden State Warriors are facing off against the Cleveland Cavaliers in the NBA Finals for the third year in a row. The Dubs are still leading the Finals 3-1 after a heated Game 4 loss against the Cavs in Cleveland -- but things are still looking good for Dub Nation. ABC7 Sports Reporter Mike Shumann spoke to Warriors assistant coach Jarron Collins after the Dubs' heated Game 4 loss to the Cavs in Cleveland. 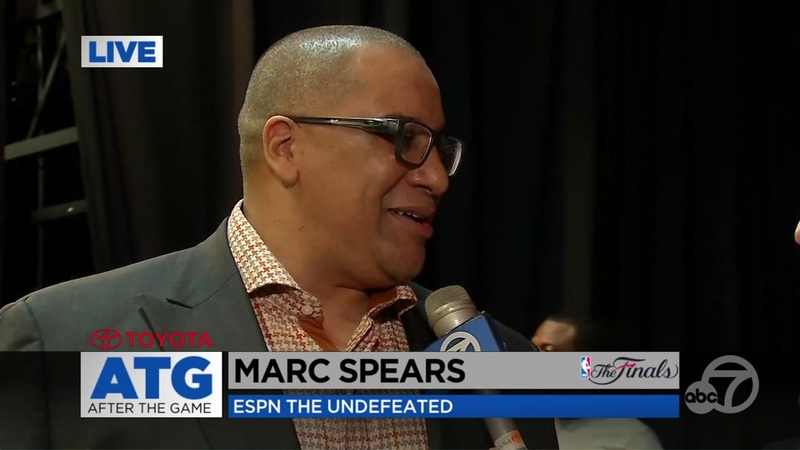 ABC7 Sports Reporter Mike Shumann spoke to ESPN's Marc Spears after the Dubs' heated Game 4 loss to the Cavs in Cleveland. Get full highlights, interviews with players, and expert insight on ABC7's "After the Game" following each game in the series. Click here for full coverage of the NBA Finals on ABC7.